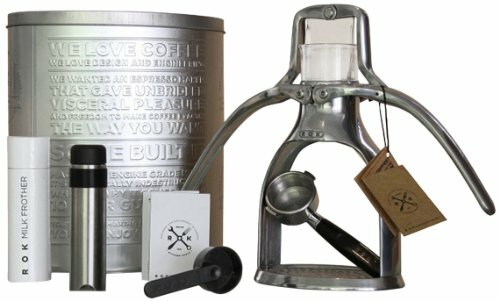 A lever espresso machine is one of the best ways to brew your morning coffee. 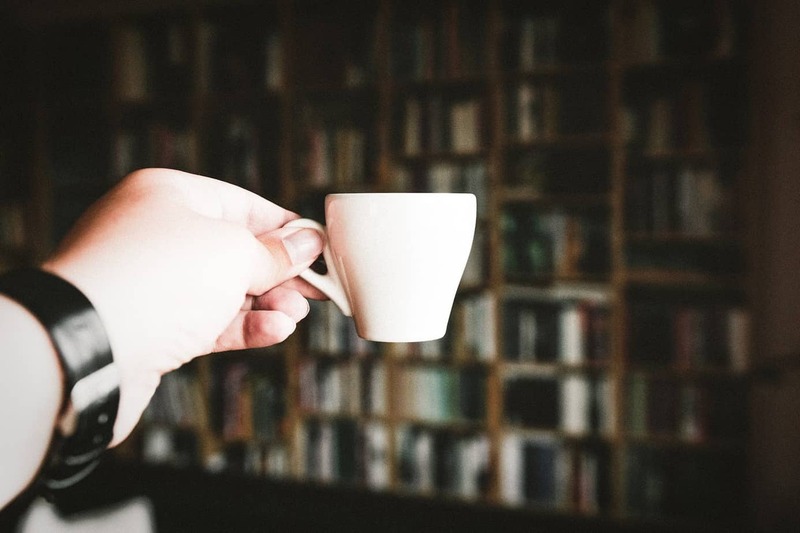 If you’re a die-hard coffee-lover, there isn’t a better way to get the perfect cup of espresso. Let’s delve into this in more detail! What’s a Lever Espresso Machine? 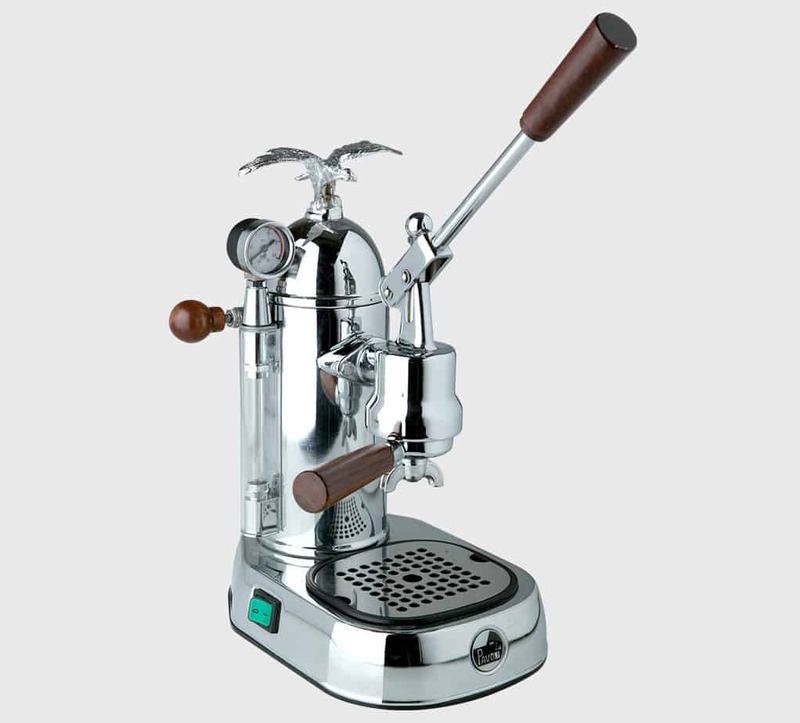 What Makes a Good Quality Lever Espresso Machine? How Do I Get a Good Shot? Before we dive into the meat and potatoes of this review, you should be aware of the different terminology surrounding this device. 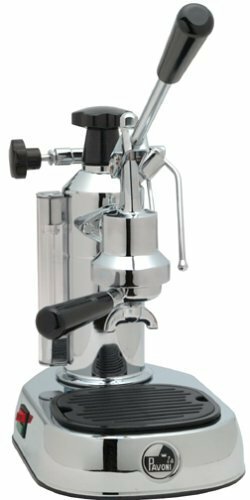 A lever espresso machine is also known as a manual espresso machine- so don’t let that confuse you! The best thing about them is that you have full control over your brew (which you don’t with an automatic machine). With these machines it’s effortless to mess up your espresso- they’re not easy to use. However, when you eventually get it right, it’s likely to be the best coffee you’ve ever had, so it’s swings and roundabouts. A spring-piston machine usually has the lever sitting in the upright position. You have to push the bar down; this primes the spring mechanism. Then, when you release the handle the spring uncoils and triggers the water to spurt through the portafilter where it’ll mix with the coffee grounds. Whereas, a direct lever machine showcases the bar in a lower position. To kick-start the device, apply pressure to the lever. This causes the water to extract the espresso. As you can imagine, this machine is trickier to use- so it’ll take some practice to master the craft! The water tank: This should hold enough water for more than two shots. Typical sizes range between 20 to 38-ounce water containers. Temperature regulation: The best brewing temperature is between 195F and 205F, so a good machine should offer this range. Material: Ideally, the machine should be crafted from brass. This is way less likely to corrode or harvest harmful bacteria. The second-best is stainless steel, then aluminum. The hardest thing to get right is the pressure to extract the coffee. You’ll need to vary the amount of weight you apply to the lever depending on the kind of coffee bean and the nature of the roast. This is where a spring piston machine comes in handy because it takes care of this variable for you. This is either a blessing or a curse depending on whether you want full control over the pressure. It almost goes without saying, to get a decent mug of espresso you’ll need a top-notch grinder to prep fresh coffee beans. Otherwise, it doesn’t matter what machine you buy; the final product will be sub-par. This is a fabulous example of a high-quality spring piston machine. Not only will it produce a delicious brew but it also makes a fabulous addition to your kitchen counter- the chrome and brass finish is stunning! The water tank boasts a capacity of 61 ounces, which means you can enjoy several shots before refilling the machine. You can easily see if it needs topping up through the transparent glass. There’s a gauge that helps you monitor the pressure of the boiler, which makes it a little easier for you to work the machine. Plus, there’s an automatic safety valve that relieves pressure if necessary- so there’s no need to worry! Lastly, the heat exchanger allows you to both brew and steam at once- how handy is that? If you’re after a spring lever device, this machine won’t disappoint. In addition to all the tech listed above, the water tank is an impressive size- you can enjoy as many as 18 shots of espresso before having to refill the machine. Although this isn’t the prettiest of models, it’s very functional and incredibly durable. It boasts four rubber legs to keep it firmly in place; this makes it a little easier to work with. Plus, it comes with a handy tin for you to store it in. It weighs less than four pounds, so it’s ideal if you want to take it with you on your travels. It also doesn’t need any electricity; you just push the lever to build the pressure- it’s the perfect device for coffee-loving campers. The ROK is so confident in their product that they’ve provided a decade-long warranty! However, this machine isn’t without its drawbacks. Unfortunately, everything needs to be pre-heated before its used, which isn’t practical. 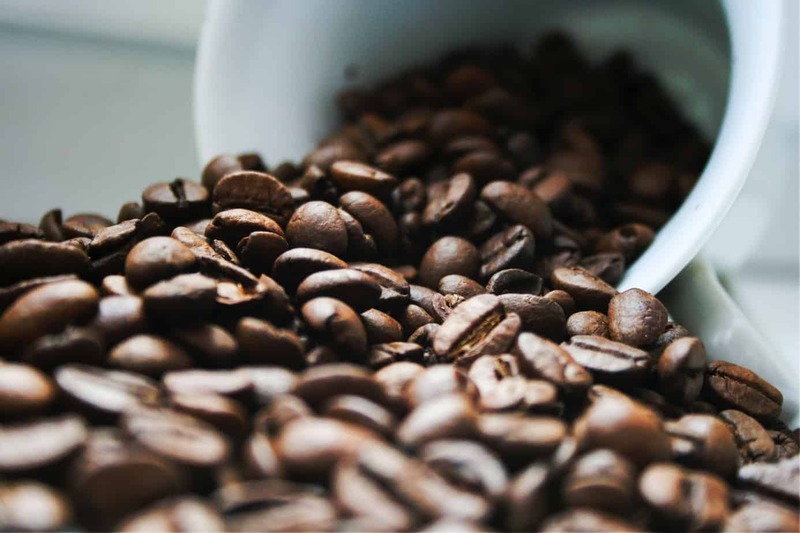 Plus, it’s challenging to get the pressure right for extraction, this means you have to be moderately experienced with lever espresso machines to get a decent cup of coffee. Consequently, critics have said this machine is better suited to making milky coffees rather than espressos. 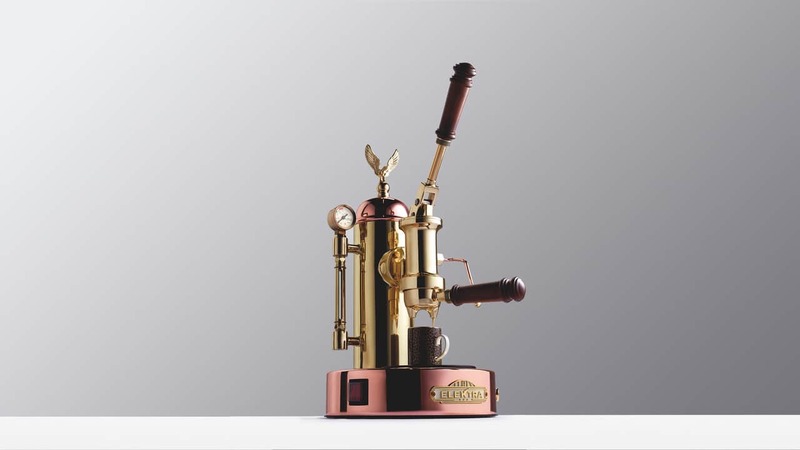 If you’re after a lever espresso machine with a vintage vibe- then La Pavoni EPC-8 Europiccola might be the model for you. This device looks like something pulled straight out of the early 20th century. Historically, smaller machines are slightly easier to use. However, it’s a direct lever device- so it’ll still be relatively difficult to master if you’re a newbie. However, you know what they say, practice makes perfect! 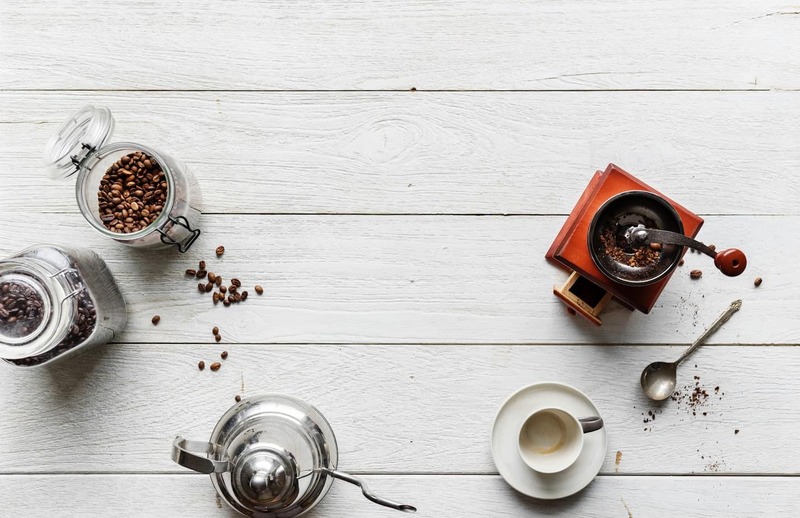 One of its other benefits is that it heats the water quickly- so you don’t have to wait too long to enjoy a steaming cup of Joe. However, the steamer reaches a slightly lower temperature in comparison to most other machines- so if a vast temperature range is essential to you, this probably isn’t the right machine for your needs. Plus, it doesn’t boast handy tech displayed in other models- like a pressure gauge. 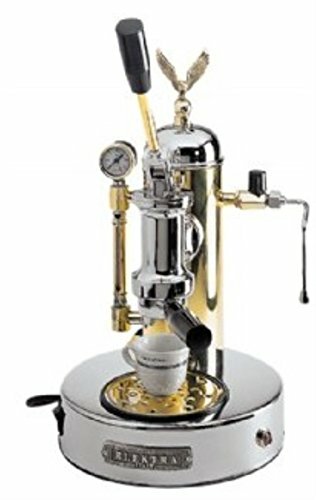 Put simply; La Pavoni PPG-16 Professional 16-Cup Espresso Machine, Brassis just an updated version of the Europiccola. However, it boasts a larger water tank (you can pull as many as 16 shots), a pressure gauge, and a better aesthetic. We love the wooden handles- these are a classy touch! This machine is incredibly pragmatic, not only can you brew and steam at the same time, but the boiler heats really quickly. Just like the Europiccola, this model is also very durable (providing you maintain it adequately). The downside is that it doesn’t have a three-way valve. This means you’ll have to wait before you can remove the portafilter (after you’ve brewed the coffee). Also, the tamper and grinder included aren’t great, which ultimately affects the overall quality of the final product. The Flair Espresso Maker is a bit of a gamechanger- it’s only a couple of years old and doesn’t use electricity which is great if you’re environmentally conscious. How does it work? You have to manually pour boiling water into a hole above the coffee grounds, and heat both the group head and portafilter yourself- not everyone’s a fan of this. We love that you can take this machine apart and put it into a bag. This is a fabulous space-saving solution if you don’t have anywhere to display a coffee machine. Plus, you can easily take it with you on a road trip! Naturally, it’s prone to more wear and tear in comparison to other machines. If you want a model that lasts for decades- this probably isn’t for you. It’s one of the more affordable ones on the market, and it’s easier to get to grips with- which makes it a fabulous choice for those who haven’t used this kind of machine before. They’ve even put a rubber base on the group head parts, so there’s hardly any chance you’ll burn yourself while brewing your espresso. The only other drawback is that you have to disassemble the machine to clean it thoroughly- that can get a little tiresome if you’re regularly using it. 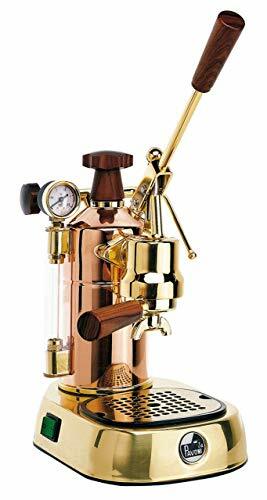 This model is another fabulous design from La Pavoni- crafted from golden colored chrome, featuring rustic wooden handles, this machine is the perfect addition to any kitchen counter. Rest assured, this design is covered in lacquer to avoid scratches. Again, you’ll need a lot of practice to make the most if this machine. However, once you get it right- the results will be worth it! However, the heating elements are exposed, which means you’ll need to proceed with caution- otherwise, you run the risk of burning yourself! 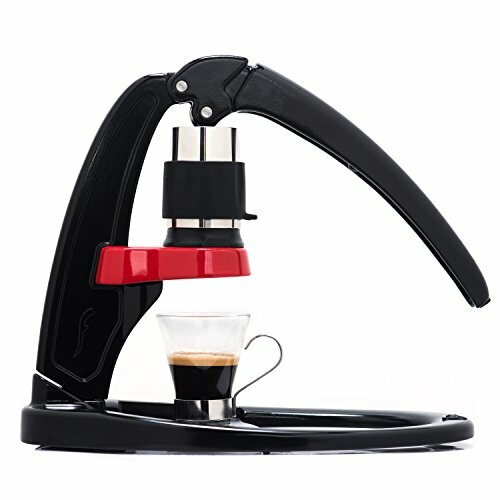 We hope this review helps you find the best lever espresso machine for you. If you’re new to the game, we thoroughly suggest opting for a spring-piston lever, because as we’ve said, this makes brewing a delicious cup of espresso slightly easier. However, you can’t go wrong with any of the models listed in this review- they’re all excellent quality!